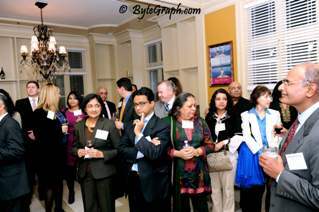 For its first social event of the year, the Georgia Indo-American Chamber of Commerce (GIACC) was pleased to offer a reception co-hosted by GIACC and the Consulate General of India, on Tuesday, February 26th, at the Consulate on Glenridge Drive in Atlanta. 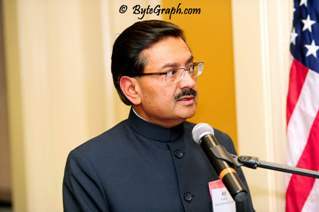 Consul General Ajit Kumar gave the welcome and spoke about India's economy, opportunities for India-U.S. business cooperation, Indian companies in the states, and Georgia's companies in India. Chairman Ash Thakker, President David Gault, President-Elect Viren Mayani, and other board members and officers gave an overview of the coming year. See below for more photos of the event. 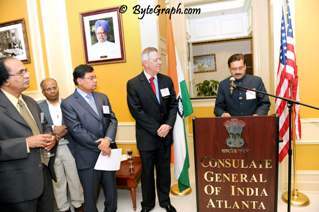 Welcome to the new Indian Consulate in Atlanta. It is an honor to host GIACC and you all. As one of the largest and rapidly growing economies, India has been witnessing extraordinary changes in the last two decades or so. India has emerged as one of the key drivers of global growth and an important player in global stability. In recent years, India’s economic performance has been amongst the best in the world. India's Gross Domestic Product grew five-fold from USD 325 billion in 1990 to USD 1,850 billion in 2011. India, today, is a robust economy, and 3rd largest in terms of purchasing power parity. Indian economy is pursuing a path of high economic growth alongside strong ongoing measures towards its modernization and integration with global economy. But India’s growth and development, as also the fabric of India-US economic ties, is also influenced by the developments in the global economy. As such, we cannot ignore its salience. Last year has been a challenging year for the global economy with after effects of the financial crisis posing considerable challenges for the global economic recovery. India, too, faced some slowdown in its economic growth last year mainly due to external factors. From an impressive average annual GDP growth rate of over 8% between 2004 and 2010, India’s growth declined to 6.5% in 2011-2012 and may fall below 6% in the current year, though next year seems more promising in reaching 6 to 7% growth. But the fundamentals of India’s economic growth remain strong and intact. In the current year, our focus would remain on regaining strong growth; containing any inflationary pressures; and pursuing a process of economic reforms in line with our developmental objectives. Our optimism for such long-term sustained high growth trajectory in India is underpinned by the current factor mix: First, the savings and investment ratio continues to remain high. Second, favorable demographics with over half the population in their twenties. Third, rising middle class incomes in both rural and urban areas continues to sustain high domestic demand buoyancy. Fourth, India is making rapid and large investment on infrastructure, both social and physical. In fact, infrastructure is a trillion dollar opportunity in India as we try to build many new airports, ports, roads and bridges. Through the difficult period of 2012, India remained a favored investment destination. •	Foreign funds pumped in an estimated $24 billion into the stock markets that was one of the largest-ever such investments in a single year. Due to these and other factors, India's foreign exchange reserves today remain healthy at around $300 billion. The inflation rate has come down from double-digit levels to a more manageable 6.2 percent. Factory output and exports have also started to look up. Little wonder then that India's stock market is on a roll. In fact, it ended 2012 as the third best performer globally, with a return of 25 percent from the Sensex of the Bombay Stock Exchange. For global investors, there was much to cheer, notably since last September, when Prime Minister Manmohan Singh announced a series of bold and far reaching decisions. •	Bills were cleared to make eventual legislative changes that will ease India's financial sector further in areas like banking, insurance, and pension. Some of these measures have already been rolled out – and companies have started opening stores. (Brooks Brothers, Fossil, Gant). IKEA of Sweden has also obtained clearance to set up its own units in India. India has become a hub for manufacture of small cars and companies such as General Motors, Toyota, and Volkswagen have led a wave of investment in new factories in India spending $5.5 billion in 5 years till March 2012. Many foreign companies in India are prospering especially companies which are well entrenched like Suzuki, Nestle, Unilever, and Siemens. India continues to become an R&D hotspot with over 200 of the Fortune 500 companies setting up R&D centers. Also IBM is now the second largest private sector employer just after TCS. The government wants to send a very clear message: that we are committed to reforms and economic growth, that we are an investor-friendly government. India's economic progress is not only a key factor of stability in the global economy but also a source of immense economic opportunity for the world. As high growth trajectory is sustained, with a steady increase in the disposable incomes from expanding work force, India is expected to emerge as one of the world's largest consumer markets by 2030. Also according to some analysts, India could become the third biggest economy in the world by 2030. India is making a transition from Agriculture to a Services economy. Our continuing focus to strengthen manufacturing, our 300 million strong middle class, and our quest for technology based international partnerships to propel the innovation eco-system in India, have not only shaped the direction and nature of India’s economic development, but have also defined the nature of India’s trade and investment relations with other countries. Nowhere is this more visible than in our ties with the United States. The trade and economic cooperation is a central pillar of expanding India-U.S. partnership. Our two-way trade in goods and services combined touched around US$ 100 billion last year. Capital flows are now a two-way phenomenon. The US businesses are becoming strong partners in India’s economic growth story; and Indian businesses are creating value, wealth, and jobs in the United States. For example, Indian IT companies supported 280,000 jobs last year, of which 110,000 were directly employed. Our defense partnership, once described by former U.S. 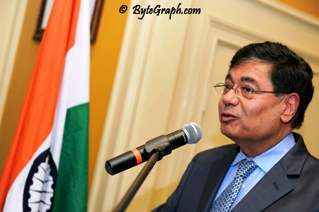 Ambassador Blackwill to India “as flat as a chapatti” has seen exponential growth. India, since 2005, has placed orders for procurement of defense equipment from the U.S., for its armed forces, totaling now more than $9 billion; we conduct regular military exercises and have engaged in useful dialogue between our defense departments. Energy sector is another opportunity for us to collaborate. Education is also, similarly, a strategic area for our partnership. In the field of health, India has 14 cooperative ongoing projects with Center for Disease Control and Prevention (CDC) based in Atlanta. The most notable one is establishment of Global Disease Detection Center being established in India. Going beyond all this, I feel the strongest element in our partnership is the people-to-people dimension. 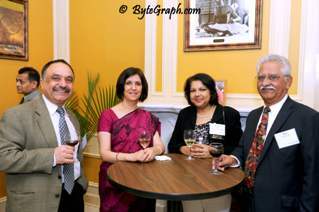 The 3 million strong Indian-American community has also come of age and plays a vital role in expanding the numerous connections which make our relationship people-centric. More than 100,000 Indian students study in U.S. universities, with $3 billion as tuition fees. 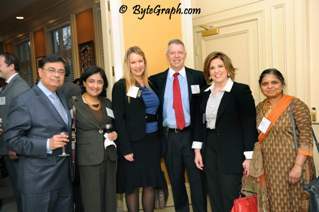 There are 60,000 Indian origin doctors in the U.S. (AAPI). 40% of all hotel rooms in US are owned by Indian Americans (AAHOA). In a recent Pew report, Indian Americans emerged as the highest income and best educated among the Asian Americans in USA. They seamlessly straddle the two societies and bridge them through their professional and business involvement in both the United States and India. The community is a tremendous source of strength for our expanding relations. 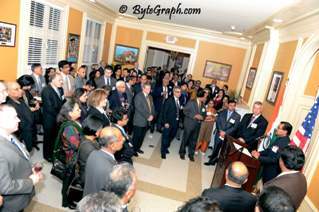 I salute the Indo-American community also in Georgia playing the stellar role and being that bridge that connects our two societies and strengthen the bonds of friendship between our two peoples. There is also an increasing interest and interaction between various states of the US and Indian states. For example, with Georgia in 2011, India’s exports were over $1319 million which was a 77.5% increase over 2009. 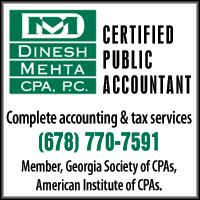 Similarly, Georgia’s exports to India totaled over $579 million, which was a 38.8% increase over 2009. 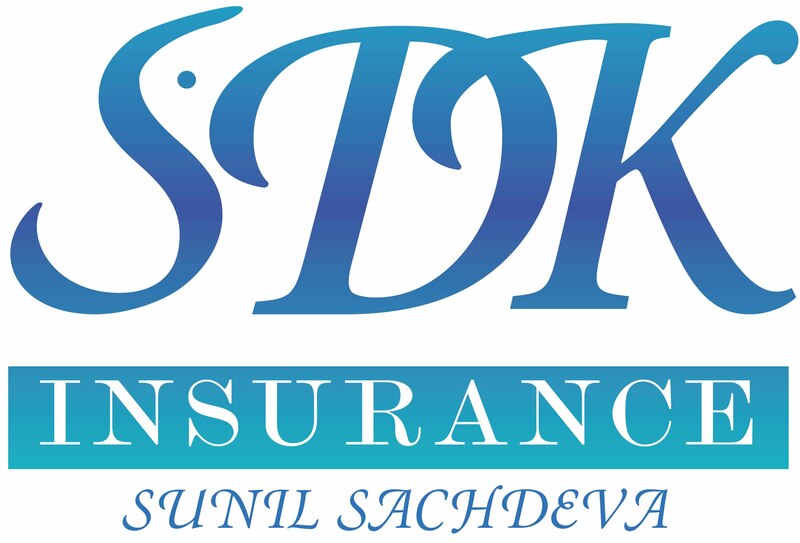 30 Georgian companies are operating in India, and around 40 Indian companies are operating in Georgia. Novelis is the global leader in rolled aluminium and aluminium recycling. India’s Aditya Birla Group acquired Novelis for about $ 6 billion in 2007 and is making profits. Novelis R&D Center in Kennesaw is adding 250 jobs. 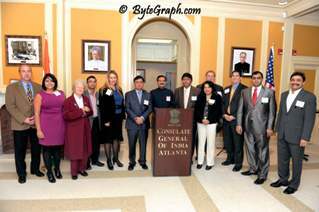 Last year, I inaugurated an Infosys Center in Atlanta. Wipro, TCS, and others are also adding to jobs here. In visits to Florida and Tennessee I called on Governors – meeting with Chambers of Commerce in Florida and Tennessee. I met Mr. Fred Monk, Chairman of South Carolina International Trade Coalition today. 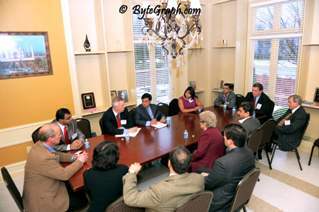 There is tremendous potential of expansion of trade and investment between India and Georgia and other 7 U.S. states. The establishment of Indian Consulate will give further impetus to develop closer relations with India in all its aspects. I am happy to inform you that the Indian State of Karnataka Biotechnology and Information Technology Services (KBITS) signed an MoU at Bangalore at India Bio on February 4 for collaboration in the bio-tech industry with Georgia Department of Economic Development. Coca Cola last year announced investment of $3 billion in India. Other major companies such as Lockheed Martin, United Parcel Service, and Equifax have also used joint ventures to deepen the engagement with India. UPS has a joint venture with India’s domestic carrier Jet Airways for its operations. India has ordered 12 C130Js transport planes from Lockheed Martin for the Indian Air Force being manufactured in Marietta; this multi million contract has assisted many jobs. Lockheed also has a joint venture with Tata Group to produce some components for C130Js in Hyderabad, India. 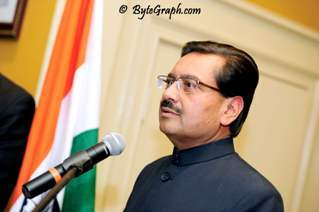 Though the India Consulate opened on 1st October, 2012, we have not been able to offer full consular services. 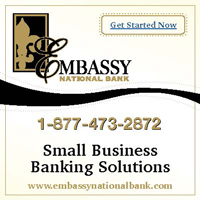 We are presently issuing passports (we have issued over 2,000) and offer miscellaneous consular services. We will be offering visas and other services later in the year. 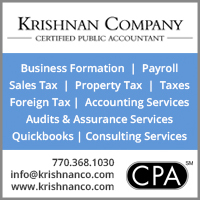 We will assist all American business persons desiring to visit India in obtaining business visas, when we start visa services. 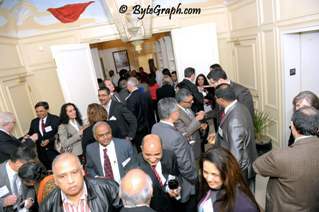 Once again, thanks for coming to the Indian Consulate. I wish you a pleasant evening. You can have some Indian cuisine later on. Thank you very much. 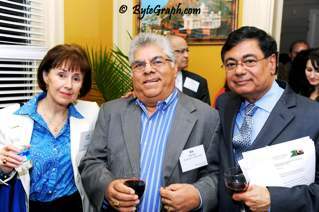 Below left: GIACC met before the reception, in one of the lovely rooms at the consulate. 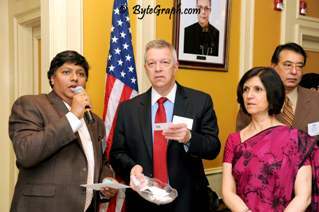 Below left: Viren Mayani, David Gault, and Mrs. Margret Kumar handled drawings for prizes.